As an alternative lender, Wall Street Funding has helped thousands of businesses deemed ineligible by traditional lending qualifications access financing. Wall Street Funding does not evaluate borrowers strictly based on credit scores. Thanks to a fast and painless application process alongside a relatively quick disbursement of funds for approved submissions, small businesses lacking an established history can get capital the capital they need. 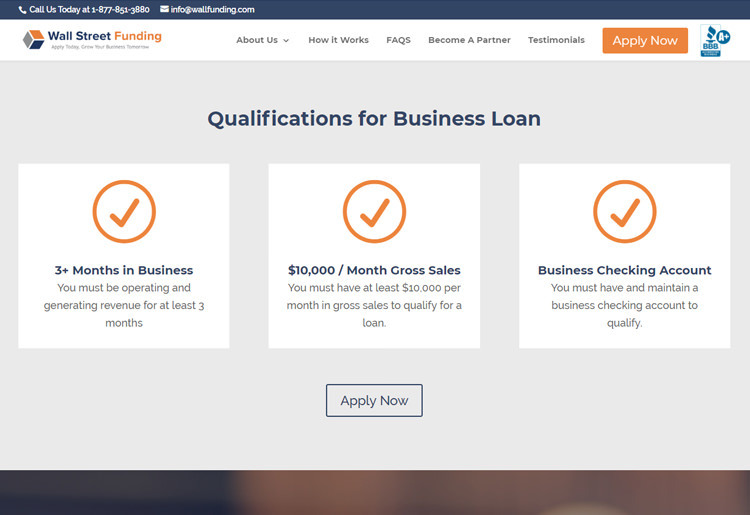 Founded in 2008 and based out of New York City, Wall Street Funding is one of the most rapidly growing alternative lenders for small businesses across the US. Started by a group of small business owners with over 50 years of combined lending experience, the company provides fast and reputable solutions for businesses across industries seeking capital. After completing a simple application process, businesses can receive approval as quickly as 24 hours following submission. If approved, borrowers can see funds enter their business account in as little as 72 hours. Wall Street Funding specializes in aiding small businesses which might otherwise be turned away from traditional banks and institutional lenders because of a lower or missing credit score. Instead of focusing on these metrics, Wall Street Funding opts to review past spending habits and monthly revenue for each applicant along with their financial history. This paints a broader picture than just simply evaluating a credit score. Wall Street Funding delivers a financing solution for all types of businesses from various industries seeking capital. The lender does not discriminate based on credit scores and understands that a low credit score is not necessarily an indicator of bad business practices. For businesses feeling burdened by a score which is less appealing for institutional lenders, Wall Street Funding provides a trustworthy option. Similarly, newer businesses that have yet to build a strong credit scores can also readily uncover a financing choice with the company. Prospective borrowers with weaker credit scores and newer business without credit scores at all typically face significant hurdles and less likelihood of approval when applying from banks and traditional lenders. Thanks to Wall Street Funding, these types of newer or less creditworthy firms have an accessible alternative when facing trouble finding capital. Unlike lenders that focus on more traditional loan products, Wall Street Funding takes a slightly different approach, opting instead to operate a system of cash advances for business borrowers. Companies applying for financing through Wall Street Funding can typically receive anywhere between $10,000-$500,000 depending on their needs and financial history. However, already established clients of Wall Street Funding may sometimes receive as much as $1,000,000. In contrast to metrics classically employed to evaluate a company’s creditworthiness, Wall Street Funding is more interested in a business’s track record and outstanding receivables when it comes down to determining eligibility. Qualified applicants will enjoy the fast approval rate, which often spans less than 24 hours. After approval, companies can see funds enter their account in as little as 72 hours. Furthermore, borrowers benefit Wall Street Funding’s clear fee policy which excludes upfront fees, prepayment penalties, and compound interest, making Wall Street Funding an attractive option for companies who need working capital while awaiting incoming revenues. 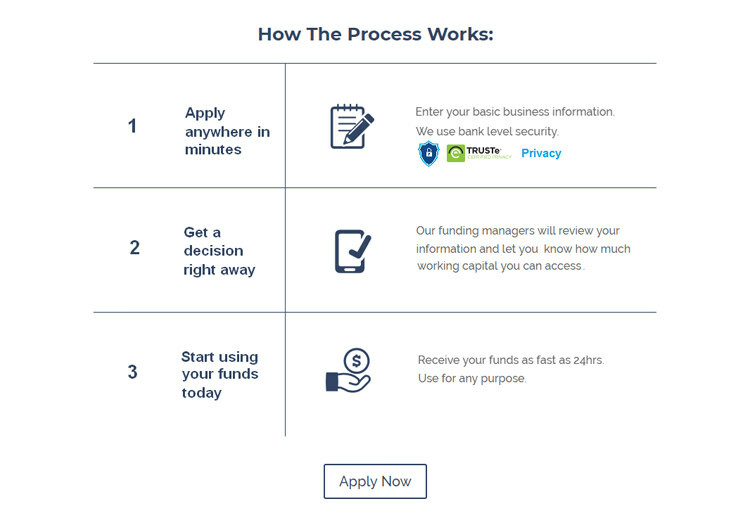 One of the main advantages of working with Wall Street Funding is their exceptionally fast application process. The initial form, which is just a few short questions, can be completed in under 10 minutes on Wall Street Funding’s website. Potential customers filling out the form will select answers from a drop-down menu covering a business’s past income, their funding timeframe, and how much financing they are seeking. Wall Street Funding also requests to receive an estimated credit score, but maintains it does not influence their funding decision. The actual application itself is only one page long and asks for very general information including pertinent details regarding the business, ownership, and basic financial data. Those applying should also have at least 3 months of complete bank statements prepared for Wall Street Funding to use for approval purposes. After sending in the application, Wall Street Funding will analyze the information and decide on approval within 24 hours. When approved by Wall Street Funding, advances can be sent to a company’s bank account in under 72 hours. Only after approval will customers receive more information regarding specific advance terms, interest rates, and other information. A borrower does not need to pay an upfront fee to apply and loan offers are not obligatory. Where Wall Street Funding differs from other private lenders is in the type of funding they give to their clients. The company does not offer traditional “business to business” loans. Instead, they work on a system of cash advances for their borrowers based on receivables. Through the advance, the company purchases portions of future gross revenue receivables at a discounted price. The parameters for each advance are set individually according to the borrower’s financial needs on a case by case basis. As a result, not much information relating to terms is available on the website itself apart from the range of funding amounts available. However, the company boasts that they do not require collateral to reach an agreement with a borrower. In addition, terms are based on a prospective client’s past monthly revenue and financial history, helping strip away the credit score component most lenders use to assess a borrower’s repayment ability. Due to the nature of their financing option, Wall Street Funding’s repayment terms differ by case. Cash advances are either repaid as a portion of daily credit card transactions or via ACH bank transfer which enables Wall Street Funding to deduct a percentage of revenues from the borrower’s bank account. Although precise terms such as the rate a borrower will need to pay to access financing is not readily visible on the website alongside the total repayment duration available for cash advances, the company does not charge compound interest or prepayment penalties. For potential borrowers with questions or comments, Wall Street Funding customer support can be reached by phone and email. Their email response rate is timely and phone support representatives are communicative. While we appreciated the telephone number provided, it was not made clear whether the helpline was available 24 hours a day, or only during normal business hours. A live chat feature would also be useful for customers seeking quick responses to smaller inquiries. Furthermore, the FAQ section could also be expanded upon to cover more pertinent details of the company’s financing solution. As an alternative lender, Wall Street Funding has helped thousands of businesses deemed ineligible by traditional lending qualifications access financing. Rather than evaluating potential borrowers strictly based on credit scores, Wall Street Funding seeks to understand a company's growth potential. Consequently, companies with less than flattering credit scores or no credit are qualified to receive cash advances based on revenues instead of credit. Thanks to a fast and painless application process alongside a relatively quick disbursement of funds for approved submissions, small businesses lacking an established history can tap into capital the capital needed to accelerate growth and finance new projects. Apart from distributing over $100 million in funding to small businesses since inception, Wall Street Funding boasts a reputable A+ rating from the Better Business Bureau, helping add to its credibility for businesses seeking financing but struggling due to their credit scores or lack thereof.